Attorney General Bill Barr on Tuesday defended his handling of special counsel Robert Mueller's report, saying he believes it is "important" for the public "to learn the results" of Mueller's wide-ranging probe and to make as much information public as possible. 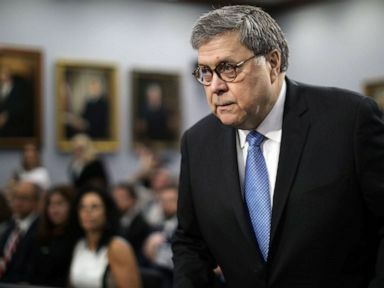 "I'm operating under a regulation that was put together during the Clinton Administration and does not provide for the publication of the report," Barr said. "But I am relying on my own discretion" to make information public, he added. Barr said a redacted version of Mueller's full report, totaling nearly 400 pages, will be released sometime "within a week." At the start of the hearing, Democrats made clear they would be pressing him on what one of them called the "unacceptable handling of special counsel Robert Mueller’s report." Rep. Nita Lowey, a New York Democrat, said the "principal conclusions" Barr released in a letter to Congress two weeks ago, including his determination that no obstruction-of-justice charges are warranted against President Donald Trump, seemed "to cherry pick from the report to draw the most favorable conclusion possible for the president." "In many ways, your letter raises more questions than it answers," Lowey said. Barr said the Justice Department offered Mueller a chance to review his letter to Congress before it was sent "and he declined." Nevertheless, Barr said he "suspect[s]" there were members of Mueller's team who wish more information from Mueller's full report was already released, especially as part of Barr's four-page letter he sent to Congress two weeks ago. But Barr told lawmakers Tuesday he "was not interested in putting out summaries." "I think any summary not only runs the risk of being under-inclusive or over-inclusive, but also would trigger a lot of discussion and analysis that really should await everything coming out at once," Barr said. "I felt that I should state the bottom line conclusions ... [and] the bottom line is binary, which is: charges or no charges." Asked whether he agrees with Trump that Mueller completely exonerated the president, Barr said "it's hard to have that conversation" before the report is publicly released, so he urged the public to be patient. But he did says he expects Mueller's concerns about possible obstruction of justice to be made public. "As things stand now, I don't think they will be redacted," Barr said. Lowey, however, said the short time between his receipt of Mueller's report last month and the release of his conclusions two days later "is more suspicious than impressive." But Barr insisted his conclusions weren't made hastily. "The thinking of the special counsel was not a mystery to the people at the Department of Justice," and. "There was an inkling as to some of the thinking of the special counsel," Barr said. According to Barr, Mueller and his team "had been interacting with the deputy attorney general and lawyers supporting the deputy attorney general in his supervision of the special counsel," and more than a month ago, Barr and Deputy Attorney General Rod Rosenstein met with Mueller's team for "a preliminary discussion about the report," so the Justice Department had an idea of what "was coming our direction," Barr said. Lowey, meanwhile, acknowledged that before Mueller's report is released, "portions of it must be redacted as a matter of law." Still, she said, "My hope is that you will stop there and bring transparency to this process as soon as possible." "The American people deserve the facts," she said. Barr said redactions in the report when it's released in the coming days will be explained through a color-coded system with the report. According to what Barr told lawmakers about the Justice Department's budget request, his four top priorities are combating violent crime, improving immigration laws, fighting the illegal drug epidemic and protecting the homeland from national security threats, according to the remarks released Monday afternoon. Attorney General William Barr arrives to testify in the Rayburn House Office Building on Capitol Hill April 9, 2019 in Washington, D.C. The Justice Department is requesting $29.2 billion from the federal budget for the year ahead, about $2 billion more than was requested last year. In his written statement, Barr praised the committee for the money already given to the Justice Department. "In FY 2018, the Department prosecuted the greatest number of violent criminals in at least 25 years, thanks to the necessary resources provided by this Committee and Congress," he wrote. Barr also outlined the need to secure the southern border and is requesting funds for more immigration judges. New federal statistics from U.S. Customs and Border Protection show an increase of apprehensions along the border over the past several months. The attorney general's testimony on Tuesday comes days after Homeland Security Secretary Kristjen Nielsen resigned.